Garnier moisturizer Moisture Bomb SPF 30 Review:How Good Is This? Another quality product from one of the world’s largest beauty houses, Garnier, comes the Garnier Moisture Bomb SPF 30, the newest addition to its widely regarded line of day and night moisturizers. So, how is this new product different from other Garnier moisturizers? This product is characterized by an ultra lightweight, ultra sheer formulation that quickly penetrates skin and does not leave grease on the surface. It is made with a moisture and antioxidant rich powerhouse that consists of goji berry extracts, pomegranate extracts, Vitamin C, Vitamin E and hyaluronic acid. Combined, these ingredients flood skin with moisture as they simultaneously work on improving the skin’s protective barriers to keep moisture in and prevent surface evaporation of water. It further effectively protects against the cell-damaging impact of free radicals. The SPF 30 formulation allows the skin time to recover and become rejuvenated without adding up to the damage that needs to be treated by blocking out UVA and UVB radiation. Unlike most other moisturizers, the Garnier Moisture Bomb SPF 30 will not leave a heavy, sticky, tacky feeling on your skin — like it’s bare there! Product is recommended for use on all skin types although, the presence of highly irritating ingredients in the formulation may not make it suitable for use by people with sensitive or problematic skin. To avoid unnecessary allergic reactions, always perform an overnight patch test to examine how your skin will react to the product before applying liberally all over. Apply the product on thoroughly washed and dried skin only. 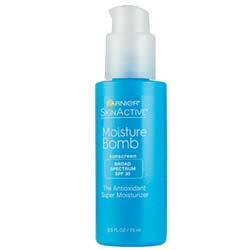 Reapply throughout the day to take advantage of SPF benefits. sunscreen actives used are found to be highly irritating. Making product choices isn’t meant to be easy and it never will be. For consistency in the personal choices that you make, two things are necessary. First, you have to make up your mind about what your beauty philosophy is. Second, you need to make a commitment to stay true to the philosohy that you’ve chosen. Act on it accordingly and with consistency.